B&M Lifestyle | Can I Feed my Pet Chocolate this Easter? Here’s What You Need to Know! We’re up to our eye-balls in chocolate eggs at Easter that it’s impossible not to over-indulge! Such is the excess of chocolate, it might be tempting to share your joy with your furry friend. Here at B&M HQ, we’ve put together our top tips and health advice for treating your pets this Easter. Can I feed my cat or dog chocolate this Easter? Why shouldn’t I feed my pet chocolate? Chicken? Sure. Carrots? Absolutely. Chocolate?...not so fast! We all love to treat our pets, and the occasional portion of chicken in their bowl or raw carrot as a snack certainly won’t hurt your cat or dog. But there are some foods you absolutely must not offer your four-legged friend! With an excess amount of chocolate in the house at Easter, there’s bound to be a time when your pet shows more than a passing interest in your Easter egg stash. But under no circumstances should you give in to those puppy dog eyes: human chocolate is poisonous to dogs and cats! The toxic ingredient in chocolate is theobromine. Humans metabolise this with no problems, but for dogs and cats the process takes a lot longer, allowing toxic levels to build up in their bodies. Other foods to keep out of their pet bowl include (but aren’t limited to): coffee, grapes, raisins, garlic, onions, macadamia nuts and avocado. What should I do if my pet accidentally eats chocolate? If you find your pet rustling around inside your half eaten Easter egg, take them to the vet immediately. You may have been told that small quantities might 'only' make them sick, but it’s not worth taking the risk. Even small amounts can be potentially fatal! B&M Top Tip: for more information on pet poisonous foods, visit the RSPCA, and make sure you know what’s safe for your pet! What should I feed my pet instead? Just because they can’t eat human chocolate, that doesn’t mean your pet has to miss out this Easter. Made from dog friendly carob, our Scooby Snacks Doggy Easter Egg is 100% safe for dogs to get their teeth into. 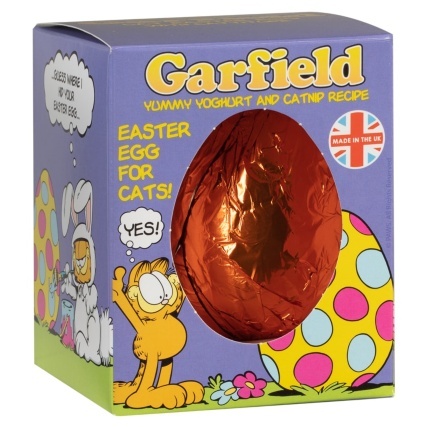 And for cats, our Garfield Cat Easter Egg is a delicious alternative made from yummy yoghurt and catnip! There are lots of safe treats you can give to your dog or cat that can be found in your cupboards, but for something extra special you’ll find a huge range of dog and cat treats in your local B&M store! 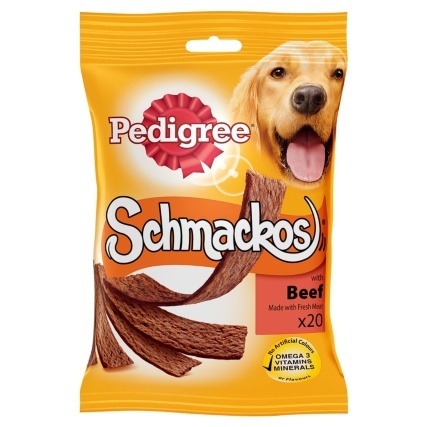 What other pet goodies are available at B&M? It’s not just about what you and your pet can scoff this Easter. Let your pooch join in the festivities with our range of dog costumes and outfits! From Easter Bunny and Duckling Dog Outfits, to Easter Bunny and Carrot Ear Hats, there’s something to keep you and your pooch entertained over the bank holiday. B&M Top Tip: don’t forget our Easter themed dog toys! Choose from Sheep, Bunny and Chick for a cuddly dog companion. What do you feed your dogs and cats as a special treat? Share your best tips and advice with the B&M Community on Facebook, Twitter and Instagram!